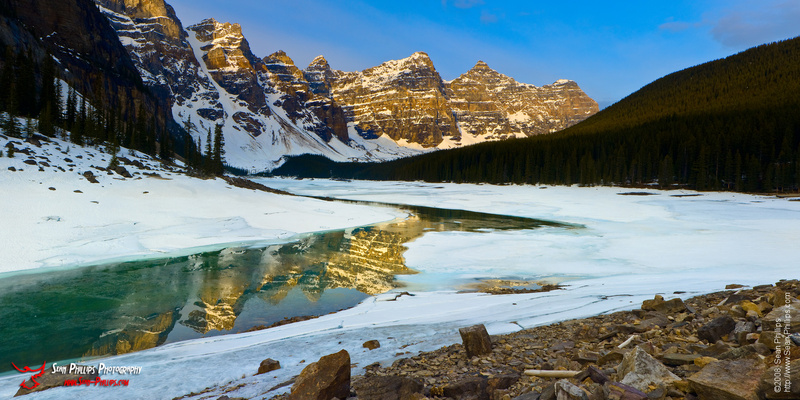 I was at Moraine Lake for Sunrise on the first day that the road up to the lake was open for the season in 2008. This popular Canadian Tourist Destination is only accessible to vehicle traffic during the summer months, usually from the May long weekend until the end of September. 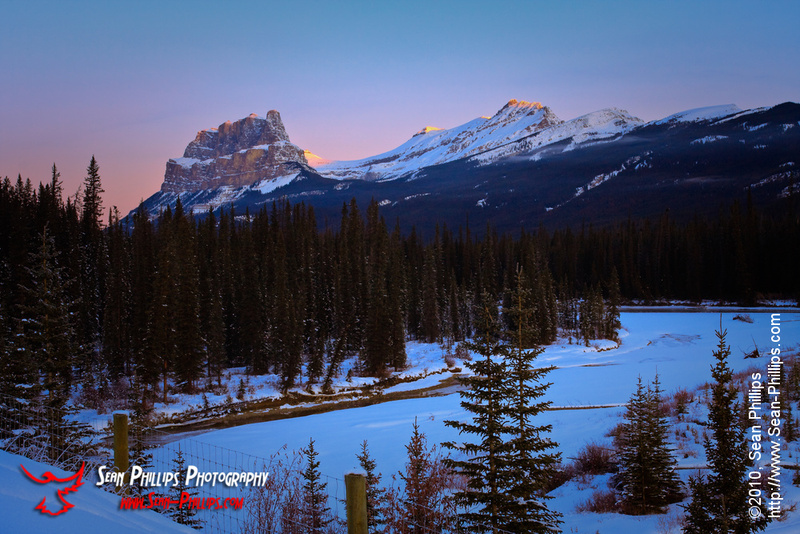 We were staying in the village in nearby Lake Louise, and I had originally intended to shoot the sunrise at the Chateau Lake Louise, but when I saw that the road to Moraine Lake was open I immediately changed my plans. Although there are many incredibly beautiful places to see and explore in the Canadian Rockies, Moraine Lake is absolutely one of my favorites. I was very excited to see that part of the lake was actually free of ice, and when I saw the beautiful golden light reflecting off the mountains and glittering across the water I was ecstatic. Moraine Lake is truly a jewel and I try to visit at least a couple of times every year. Although I created this image almost two years ago, I recently printed a large version of it and I really liked how it came out. I’ve also entered it in a couple of recent photo contests and I realized that I had never shared it here. I hope you enjoy it as much as I do! The clouds have settled in over the foothills at sunset pretty well every day for the last week. 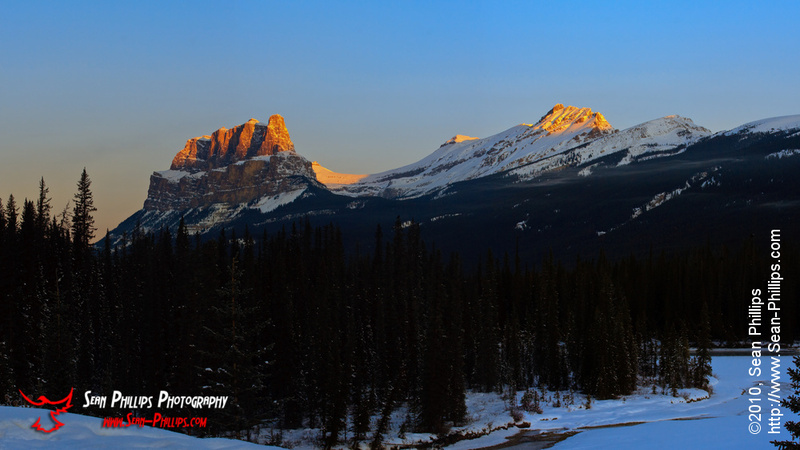 The resulting glow of the sunset over the Rockies lighting up the haze has been incredible. I’ve stopped a couple of times to try to capture the its essence in an image. Sometimes that’s a lot harder than it seems like it should be. In this case I really wanted to capture the expanse of the Rockies silhouetted on the horizon. I love how the layers are so distinct and the colors are almost magical. 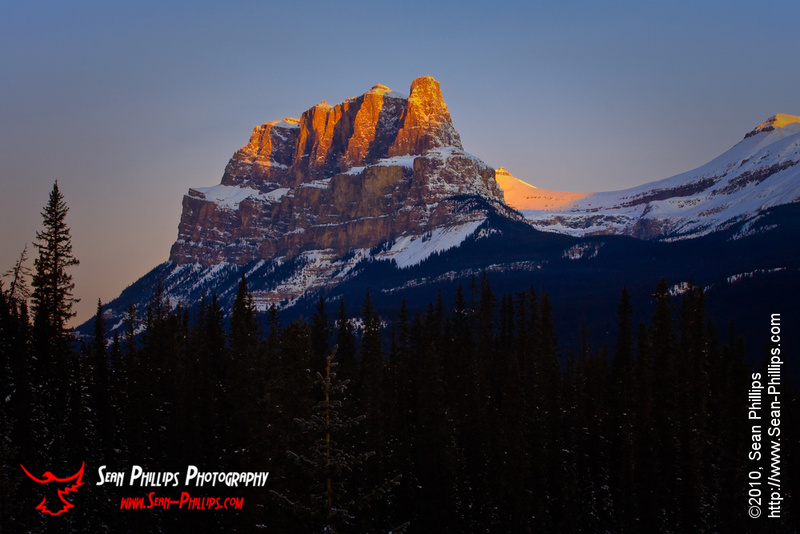 Castle Mountain is in the Rocky Mountains about half way between Banff and Lake Louise. It is a very scenic spot that looks good in all sorts of light and weather conditions. I love to see it when it is being lit up from the side because the shadows in between each of the parapet like peaks falls into deep shadow and makes the mountain look even more rugged than normal. We were passing by at just the right time the other day to enjoy the sunrise. It was a particularly beautiful thing when the Alpenglow dropped down the face of the mountain. I love the Rockies! I went out for a sunrise photoshoot with my Dad the other day while he was visiting for the holidays. It was really nice to be able to head out at a very civilized time (8:00 AM) and still be there in plenty of time to fully enjoy the Magic Hour. This is very different from the other seasons where the sunrise is much earlier in the day, and is one of the few advantages that winter photography has over the summer. 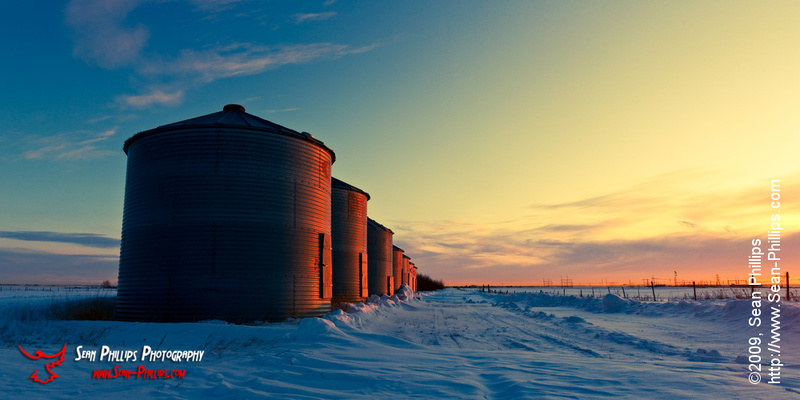 I’ve shot these grain bins before but because of their position relative to the sunrise I knew they would be a good photogenic subject to share with my Dad.